"This is my family's favorite dinner, and is loved by everyone I make it for!" Place bacon in a large, deep skillet. Cook over medium high heat until evenly brown. Drain and set aside. 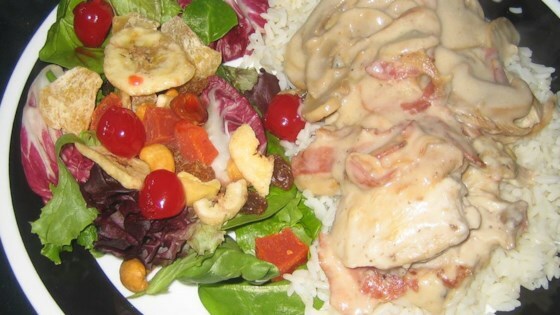 Place chicken in a 9x13 inch baking dish and cover each breast with 3 strips bacon. In a large bowl combine the soup, sour cream and mushrooms. Mix together and pour over chicken; spread out evenly. Cover baking dish with aluminum foil and bake in preheated oven for 60 minutes. 20 minutes before chicken is ready, bring 3 cups water to boil in a medium saucepan. Add rice and stir. Reduce heat, cover and simmer for 20 minutes. When chicken is ready, serve over hot cooked rice. See how to make cheesy chicken chimichangas in a savory sauce. I think I may get an engagement ring out of this one....he loved them!